‘서울 보타사 금동보살좌상(서울 普陀寺金銅菩薩坐像)’은 왼쪽 다리는 아래로 내려 바닥을 딛고 오른쪽 다리의 무릎을 세워 앉는 유희좌(遊戱座)의 자세를 취하고 있다. 이러한 유희좌는 중국 북송대부터 유행하여 우리나라에서는 고려 후기에 유행하기 시작하여 조선 초기까지 이어졌다. 통통한 뺨, 반개한 눈, 작고 아름다운 입술 등에서 여성적인 면모가 느껴지는 보살상의 얼굴 표현과 조선 전기 금동상으로는 규모가 큰 점에서 조선 초 왕실이나 지배층이 발원한 상으로 판단된다. 어깨에 천의(天衣)를 숄처럼 걸치고 그 한 자락을 수직으로 늘어뜨리고 있는데, 국보 제221호 ‘평창 상원사 목조문수동자좌상’ 등 조선 초기 보살상에서 볼 수 있는 착의법이다. 또한 이 상은 보존상태가 양호할 뿐 아니라 조선 초기에 중앙에서 유행했던 귀족적인 보살상 형식을 보여주는 예로, 조선시대 불교조각 연구에 중요한 자료로 꼽힌다. 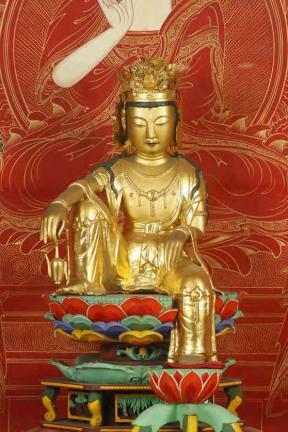 The Gilt-bronze Seated Bodhisattva of Botasa Temple in Seoul portrays the bodhisattva seated in the “royal ease” posture, with the right leg folded and the other hanging down, indicating relaxation. Statues of the bodhisattva in this posture began to gain great popularity in China during the Northern Song Dynasty (960-1127) and in Korea between the late Goryeo and early Joseon periods. This particular bodhisattva is characterized by a feminine face with attractive plump cheeks, half-closed eyes and small lips, which, along with its comparatively large size, has led art historians to believe that it was made under the commission of the royal family of early Joseon or a powerful aristocratic family. Due to its good condition and a style that reflects the aristocratic taste of early Joseon, the statue is regarded as an important resource for the study of Korean Buddhist sculpture of the Joseon period.